The Rosedale History Society will be running another of its popular history walks on Sunday 23 June, starting from Rosedale Abbey village green at 2.00pm. The route will go from there up into Northdale via Duker Bridge and Bell End, returning by Hanging Stone House, Stonebank and Heygate, then back to the village by around 5.00pm. The route may change subject to weather conditions, but all walkers should have weatherproof clothing, proper hiking footwear and are encouraged to bring water with them. 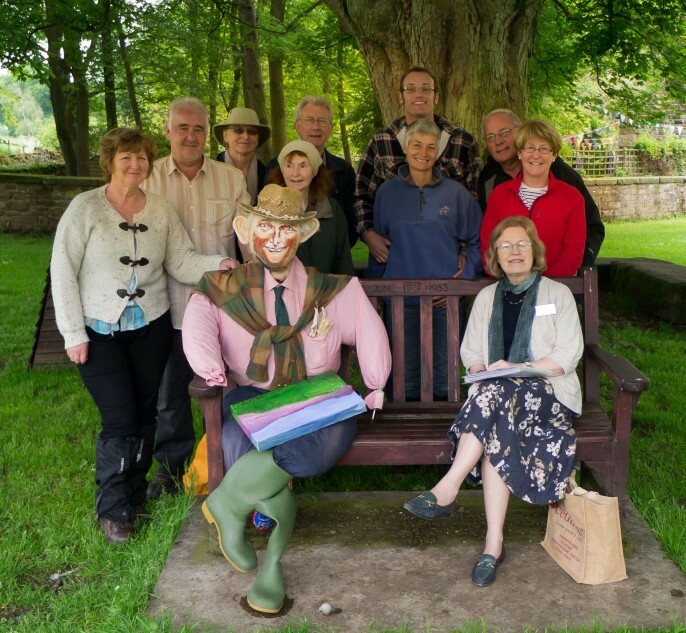 There is no need to book places and there is no charge for the walk; however, donations are gratefully accepted to help the work of the Rosedale History Society. 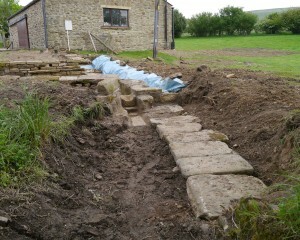 Further details can be obtained from the Secretary RHS on 01751 417071 or e-mail rosedalehistory@hotmail.co.uk . Paul Hayward, a local motor sport historian, gave a most interesting talk last night on the history of the once nationally famous hill climbs held on Chimney Bank in the the 1920s. The event, which was sponsored by the Rosedale History Society and held in the the History Room of the White Horse Farm Inn by kind permission of Christine and Jim, was attended by over 30 people, both local and visitors to the dale, with £62 being raised in donations to the Next Steps mental health charity. The Rosedale History Society holds more information on the hill climbs. Come and see it at the next Tea and Chat meeting of the Society which will be at the Updale Reading Room on Sunday 5 May from 2 to 4 pm. (4 hours +) DAY & TIME t.b.a. starting at White Horse car park. (A small charge will be made for all festival walks). The Rosedale History Society presents an illustrated talk entitled “Rosedale Hill Climbs – Endeavour and Crowds 100 Years Ago” on the subject of the then nationally famous Rosedale Chimney Bank hill climbs, to be given by Paul Hayward, a local motor historian, in the History Room at the White Horse Farm Inn on Friday 26 April 2013 at 8.00 pm. Linda Chambers about to set off on the village history walk with her co-guide, the Prince of Wales! A Rosedale History Walk took place on Sunday with a leisurely stroll around Rosedale Abbey until the black cloud burst overhead and we all ran for cover! 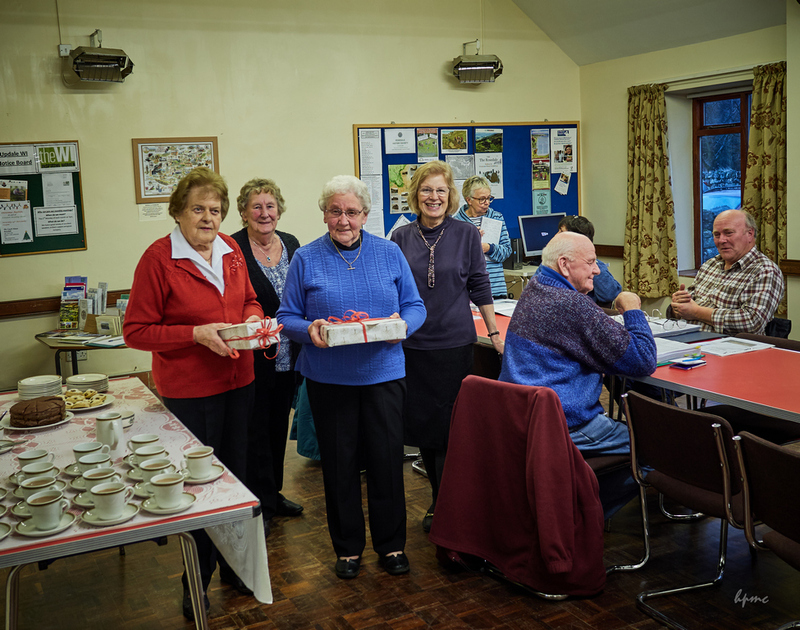 Local residents and visitors were treated to a mix of stories, facts and archive photos, which was very well received. Our next walk will be to Thorgill and Sheriff’s Pit on Sunday 15 July, starting at the White Horse Farm Inn car park, Chimney Bank at 1pm and finishing back at the pub at around 4.30pm. The distance is around 5 miles and weatherproof clothing and strong walking boots are strongly recommended – details on http://rosedale.ryedaleconnect.org.uk or click on the Rosedale History Society link in the history section of the rosedale abbey website, or tel. 417071. Paul Metcalfe was joined by a team of volunteers, members of the Rosedale History Society and Claire Shields from the NYMNP to dig out the old pond by the side of the road beside the farm. The diggers efforts were overseen by the archaeologist Shaun Richardson. 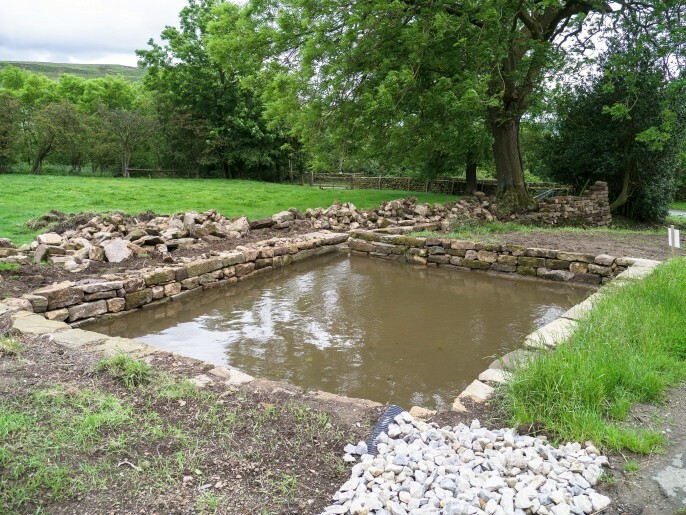 The intention was to clear out the overgrown pond and discover if any artefacts were recoverable, prior to the stone walling expert, John Randall from Westerdale, rebuilding the pond walls over the next few weeks. 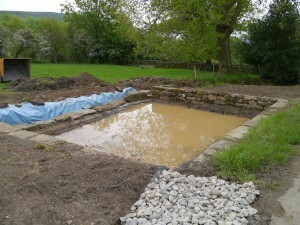 Update 2: the pond as at 23 June, with the back wall now under construction and the pond filling up nicely.